The former US President visited Scotland, home of his ancestors, in 1991 after he left office. With the unveiling of a new statue of former US President Ronald Reagan in London, STV News remembers the time that he visited Scotland in 1991. The unveiling of the statue in London was one of the many events being held around the world to mark the 100th anniversary of the birth of the former actor who became the 40th president of the United States. He was joined by former US secretary of state Condoleezza Rice as the 10-foot bronze figure was revealed. Ms Rice represented the late president's widow Nancy Reagan at the ceremony, which coincided with the US Independence Day celebrations. The statue, in London's Grosvenor Square near the US Embassy, was funded by admirers of the politician who served as US President from 1981 to 1989. In 1991, two years after he left office, the former President visited Scotland to celebrate his ancestors, who emigrated to Nova Scotia in Canada before settling in the US. He visited Blair Castle in Perthshire, where he was made a Keeper of the Quaich, a member of a body that promotes the Scotch whisky industry. It was the first time the former President and his wife Nancy visited Scotland. In his speech he quoted Robert Burns on the occasion, as well as American writer Mark Twain and also quoted a chapter from the Bible that said: "I may be absent in body, but I will be present in spirit." 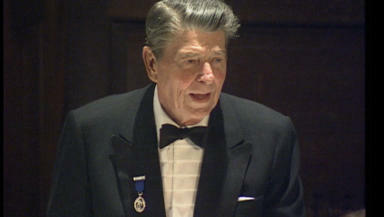 Ronald Reagan died in 2004 at the age of 93, following a long battle with Alzheimer's. He remains one of the 20th century's most significant political figures, and while he may no longer be with us, he remains in many circles very much present in spirit.